"The Assassination of Julius Caesar"
"Et tu, Brute? ---- Then fall, Caesar!" and Caesar falls dead. In Act 3, Scene 1 of the greatest of Shakespeare's play the Assassination of Julius Caesar is done. 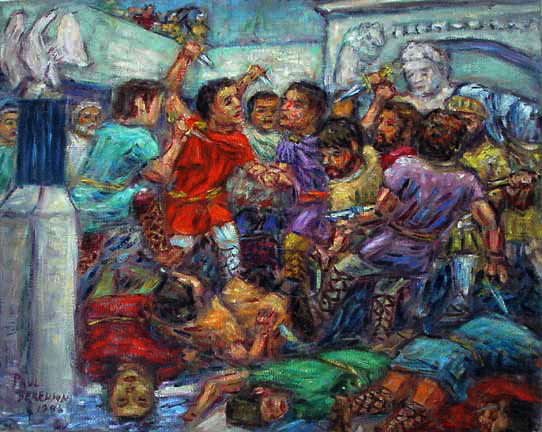 With all the knives out and bodies fallen in the foreground, Caesar has valiently fought back until he has been struck by his friend, Brutus. Senators and guards scramble in the gallery as the statue of Pompeii looks on as Rome is plunged into a bloody civil war. This was always my favorite Shakespeare play until I saw a stripped down production of Antony and Cleopatra by Penny Metropolous. I now feel like Julius Caesar and Romeo and Juliet were actually studies for A&C combining both the civil war and the star crossed love story of R&J. PaulB's Pointillistic/Impressionist original oil paintings of Shakespeare and various prints and poster formats of a wide variety of subject matter by the Pointillistic/Impressionist oil painter from landscape/waterscape paintings, dance, sports, portrait, to classical figures, flowers, rock and roll, Brazil, and Shakespeare paintings and prints are available for purchase for as little as $24.95 for an 8" x 10" matted print on photo pape. Pointillistic/Impressionist Giclee prints of Shakespeare on real canvas or heavy watercolor paper are available. One of a kind Shakespeare embellished prints, which are Giclee prints retouched in genuine oil paint by PaulB. Unless noted PaulB's original Pointillistic/Impressionist oil paintiings are oil on canvas. Paul Berenson's pointillistic/Impressionist oil paintings are in privale collections around the world, including the downtown Los Angeles Athletic Club and have appeared in numerous publications, including the New York Philharmonic Playbill. PaulB.com also builds websites and PaulB is a member of the LA Web Professionals Group.